Nintendo details Splatoon 2 app support. 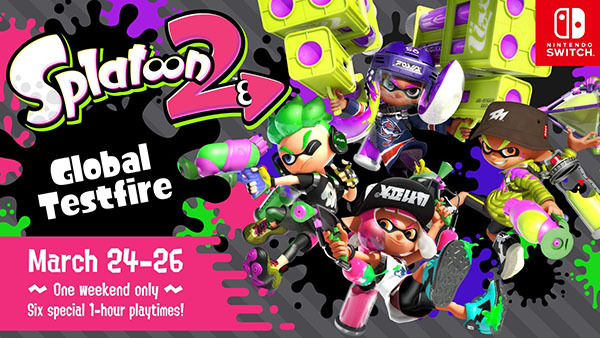 Nintendo will host a Splatoon 2 Global Testfire from March 24 to 26, the company announced. Switch owners will be able to download a demo version of Splatoon 2 that will allow them to participate in the Global Testfire, which will offer users six chances to play with other players worldwide during the three-day event. The Global Testfire will allow players to test four different main weapons, including the new Splat Dualies, as well as the remixed versions of the Splat Roller and Splat Charger. Nintendo also announced that Splatoon 2 will be compatible with Splatoon series Amiibo figures and with an upcoming Nintendo Switch app for smart devices that promises to enhance online play. This app will connect to the game and allow players to set play appointments with friends and teammates who have been added to their Switch friend list or via their social media accounts. Players will also be able to match up with those friends directly in the game or voice chat with them via their smart device. For example, during a Private Battle, players can voice chat with all of their connected friends when they divide into teams, but once teams are set, voice chat is switched to communication only between teammates on the same team. Players will need to link their Nintendo Account to their Switch system and have a voice-chat capable smart device in order to use this app. If you missed it earlier this weekend, Nintendo also confirmed LAN Play and a Private Battle Spectator view for the game. Splatoon 2 will launch for Switch this summer. Watch a trailer for the Global Testfire below.